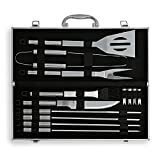 Keep your tools organized and arrive in style with this complete BBQ grilling set. Your friends and family will be impressed by your tools and even more impressed by the results. It’s perfect for camping, backyard grilling, tailgating, and picnics. It also makes an impressive gift for a housewarming or a backyard party. Give it as a wedding or groom gift or a Father’s Day gift. These sturdy, attractive and portable tools are organized in a convenient carrying case, which means no more rushing around to find items before a picnic or BBQ. Their features include elongated handles to keep your hands safe, and convenient hanging hooks. For the griller who wants to serve the best to their family and friends it’s a must have.